Without a shadow of a doubt, when it comes to Power Rangers, there is one name that stand out above the rest, Jason David Frank. 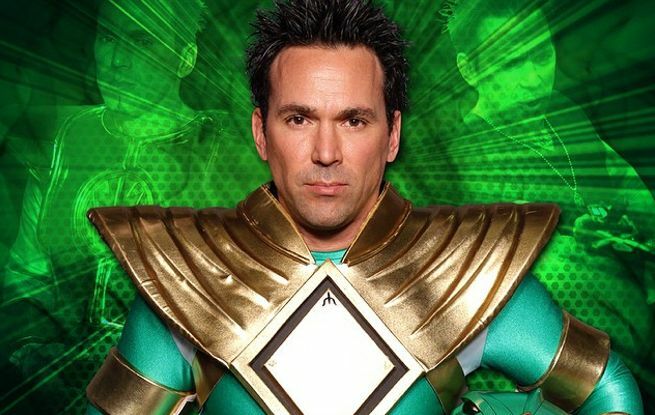 Best known as the original Green Ranger, Tommy Oliver, Frank is a staple at Wizard World Conventions and a social media powerhouse. Somehow, Frank was able to find some time between training at his martial arts school, conventions, and filming to spend some time with ComicBook.com about the second season of My Morphing Life, which debuts on CONtv. But that's not all as we cover the newest updates to the Power Rangers movie and why his fans are immensely important to him. I watched the first season. I know you pretty much self-promoted that. What made you decide to debut the second season show up on CONtv? Season one was a blast to do because it was just me sharing my life with everybody. I did everything I could to get the word out about it and it took on a life of its own on Youtube. The plan always was to dive into the second season, but this when this new opportunity popped up I had to jump on it. What I've basically done is, I filmed 10 episodes, actually 12 episodes for season two and it's ready to roll. Then, I got approached by John Macaluso one of the owners of Wizard World and CONtv, and he wanted to know if I'd be up for launching season two with the new network. He loves the show, he loves me, and he knows that I'm a huge draw for them. For me, I like working with no pressure. It was one of those things where I'm asking myself, do I want to go a network or do I want to just keep it on YouTube? I feel CONtv is the best network for my type of show. So, I'm making the deadlines now. We've got 12 episodes to turn in, in about 3 weeks and they're looking good. That whole network is going to be kind of like a Netflix. It's going to be very interesting and it's going to be awesome for a mega-fan to go in there and get sci-fi, some action, and see their favorite shows. It's going to be a big thing, and also exclusive behind the scenes Con stuff from conventions. If you miss a convention, you're able to log on and see 10 hours of specific Con material every month. You're so plugged in on social media, and sharing everything with your fans. For those who have been following you this whole time, what time frame does "Morphing Life," Season 2 take place? Will there be something new for those fans too? It's all new content. Season One will be left on YouTube on the Bat in the Sun channel. However, these new episodes will be a little bit shorter than what we did before. Previously we did one every month, so that took me a year to brand the show. Right now, we're basically going to release them, I believe, one every two weeks, but it is new material from the Con's, hanging with Johnny Yong Bosch. base jumping, the Green Ranger beat-down that we filmed, San Diego Comic Con, and all the Wizard World conventions. It was one of those things where it's all new content, all new episodes, and it's going to be great because I'm already starting to film the next season, which one way or another is going to happen. My fans, really, they like the show, and they just like being involved in what we do. I think it's going to make an interesting season, especially with the push from Con TV. Has the support from your fans been surprising at all? I feel like they've always been there, but recently as you've gotten more involved on social media and the con circuit, I feel like the swell of Jason David Frank fandom is starting to hit a fever pitch. I feel that. I was talking to a friend of mine and I was like, "I'm so surprised that people follow a 41-year old as much as they do." I engage in social media so much that no matter what's going to happen, I'm always going to share it there. I mean, on Facebook there are over 660,000 fans that I can engage with at any given point in time. And with their support, I think the record high a post has ever had was 8.2 million fans. The fans have always embraced me from day 1. I feel the fans don't owe me, I owe the fans. That's why I do so many different things for the fans. I think I look at the outlet different. Just recently, I went to a New Orleans convention, and we had big celebrities there. Celebrities from big shows, even the Duck Dynasty guys. One of the interesting things was, I looked around, I was the busiest actor out of all of them. I haven't done anything in years, and we're talking about actors that are currently working on big shows right now. I was blessed to hang with the big celebrities while at the show, but then I realized man, what is this? I was there with a couple of other rangers, and they weren't as busy as me, and I was just kind of figuring like, "what is it?" I feel because I really do embrace the fans and I feel like a lot of actors expect the fans to know them, expect the fans to come see them, without even putting out any Instagram post out or reach out on any social media outlets. They just kind of expect it, and when they don't have it, they wonder like, "Whoa, how is this guy more of a draw than me? He hasn't worked in 10 years. What am I doing that he's not doing?" It's talking to the fans. It's actually really like truly caring about what I do. That's kind of what I've always done before. It's one of those things where I think it's important and no matter what. I'm starting an online traning program and it is one of the hardest things I've ever done. I didn't sleep last night trying to get these videos up, trying to create the first online social media class, life-coaching things through it. It's really crazy. The reason why I started that was because I had a fan that I used to teach on Skype, and he loved it. It was just one person, and it was back in the days when I could take the time and train him one-on-one. He loved it. I didn't know he loved it, because he didn't really look enthused. Looking through Skype I was wondering like, "Does he like it?" He's a really good student. Well, he ended up taking his life. His mom said he was very depressed but the only thing he looked forward to was going down in that garage and training with me. That's when it all clicked. I can reach out to people through these shows, like "My Morphin Life" or TrainMeJDF.com, to give them that one thing that they might need to get through their every day. It's motivation. Look, 80% of the time I'm motivated, but there's another 20% where I'm struggling like everyone else. Everyone doesn't want to hear that 20% every day, but the want to realize, hey, I'm normal and I struggle just like you struggle. I want people to know that, first hand. I am just like everyone else, and I deal with everyday stresses. The reality show is geared more toward that 80% positive stuff, where you're not going to watch an episode, and be like really down. I think everyone needs that, including me. I get that from the fans. I see the fans and I get that from them. I see them, I'm like, wow! They keep me motivated. I think it's a good thing for all. It's an accountability partner. They lean on me and I lean on them. That's kind of what I've always done. Was there a tipping point or an "ah-ha" moment that essentially brought you back to the Con circuit and back into the public? I know you've always been busy, between your school, everything like that, but you weren't necessarily doing the Con tour that you do now. Was there a moment that made you be like, "This is what I need to do?" Yeah. Johnny Yong Bosch who was the Black Ranger, he did a lot of conventions. I never understood what the conventions were. I never understood the excitement of the fans. I mean, this is something he would plan, like a year out. They gave him money to come to these things. I never understood it, so when I did my first convention in Florida, I just went, and I never took an appearance fee. If fans wanted to buy something they could. If you don't, you don't have to. I never worried about that. To this day, with Wizard World or anywhere else, I don't take appearance fees, and that's the reason why I book so many events. There are a lot of people who don't have the money to go around and meet all the celebrities. A lot of celebrities, in fact, you have to buy something to meet them. I'm not like that. I don't want to take some what of an appearance fee to feel like I work for you. Everything I do is like one of those things where I don't want to feel obligated, so when I came into the convention world, I realized how much everyone looked up and looked forward to these events.You have to understand, I was doing these conventions before every other ranger was doing them. I was doing these before the Power Ranger movie was announced. I was doing Power Rangers, Dino Thunder when the ratings were down, so I've always been there for the fans, and I'm always supported for what I do. I've paid my dues into the convention world. I've worked for 4 years straight. I've done 30-40 shows a month. Everyone of those conventions, I do not have a contract for. I make that clear because the only thing that holds me to these conventions is my word. If I tell you I'm going to show up, sick or not, I'll go. People might plan this for years, and next thing you know, all these celebrities cancel on everybody. I get it. I had to cancel one con in Puerto Rico because I was filming the Power Rangers episode, but I pretty took a poll on that one. I said, "Hey, do want me to film or do you want me to come to the convention?" Everyone said don't cancel that. Go film for all of us, and that's what I did. When I went back to Megaforce, the reason why a lot of people didn't go back was because everybody threw these high-priced things at them, and they felt like, well, you need me. I felt like, "hey, I'll do this for the fans, and I just want to get paid what everyone else is getting paid." Are you looking to get back into a regular acting gig, or are you very happy with how full your plate is? I want to of course, act. That's one of the things I'm passionate about is I want to act. And I did Black Unicorn, which is a new series and a new movie that we're doing. At the same time, I feel that I've worked a different direction than most actors. Most actors work on a movie and then they get the fans. I already had some of the fans, so when I do a movie, I'm going to have the support. I worked a little backwards. I wouldn't say backwards, but I worked differently than most actors. I have this huge draw, like most big actors, but I don't have the movies that the big actors have. When I do have the movies, it's going to be double, it's going to be three times better than what they have because I have the fan base that a lot of actors don't have right now. They have the fan base, don't get me wrong, but they don't have that relationship with their fan base like I have. I could move mountains with my fans. All I've got to do is post and say hey, can you support this, and I do. I put emotional relationships into the bank of my fans, so I have an investment into them. Therefore, when I take a withdrawal from the fans as a favor, I get that favor because I've invested into their emotional bank account. If you keep asking, you can't withdraw anything, because you haven't put anything into their life. So trust me, I think that the fans will do a lot of favors for me that I have not cashed in on, and I don't mean cashed in on a financial level, I mean withdrawing favors. If I said, hey, I want to be in the Power Rangers movie, they'll do whatever they can to get me there. Trust me, I did a post like that one time and Lionsgate called me, Saban Entertainment called me, all the legal departments called me, and said "Please can you erase that post, can you tell your fans not to call?" They called for two days and they lit up the circuit board at Lionsgate, they couldn't work, because every fan was calling saying "put JDF in the movie," and "JDF should be in there." That's the power of social media. We could move mountains together as a team. I can't do it without everyone, but we can make things happen, and that's what's so important with my fans. Since you mentioned it, I feel like I've got to ask, are there any new updates in terms of the Power Rangers movie or everyone still in a holding pattern? We're definitely not in a holding pattern. The movie is definitely set for this year. Everything is in place. They won't give me specific details because it's all like hush-hush. Even me, I try. I email Saban and ask them kind of what you're asking me, but they do feel that I'm going to be part of it, because they feel there's no movie, at least, without me. The funny thing is, one way or another, whether it happens or it doesn't, I've been great to Lionsgate and I've been loyal to Saban. It's not like they owe me, but if I want to ask for a personal favor, I've invested into their emotional bank account. I feel like it's fair to have that withdrawal with them, because I've done nothing but support them for the last 10 years, 20 years in fact. So when that happens, I don't need to cash in any favors. I believe it's going to happen anyway, but when it does, I'll keep my fans involved, but I will tell you it is being filmed this year. I know that for a fact. It's going to be great when it is. Will we get any episodes of "Morphing Life, Season 3" from the set of the movie? I tell you what, we're filming "My Morphing Life, Season 3" anyway. One way or another, what happens with the network or not, it will cover the move...trust me, those are good stories for me to cover for my fans. Anything that happens this year, is definitely going to be covered by the show, because I like sharing it. The reality show never started as a financial thing. It started as a fun thing for the fans. It's a great social media tool, to get them interested in what JDF and his family are doing. Even my wife and my daughter are requested when I'm doing these conventions. Everyone wants to know how Tammy is, and how Jenna is, and that just shows me the fans are supporting who I am. Of course it's exciting, to be the Green Ranger, so when people talk to me and say well, we want to do this, we want to mainstream and take some of that stuff away, then you can go kiss off, because my life is me, and fans do want to see the Power Ranger stuff. With shows like "Basketball Wives" and "Mob Wives", that's all they talk about is what they used to do. I can't hide the fact and turn mainstream without Power Rangers or missing the JDF show. I'm not going to deny what I'm doing. That's not possible, and that's not what I'm going to do. The great thing for me and Tammy is that we're financially secure, and financially set, so all the extra stuff we're doing, we don't financially need to do it, at all. There's a lot of things we do to cover costs of websites and cover costs of this and that, so it doesn't of course, come out of our pocket. It makes sense for everyone. That's one of the things that I think that fans realize is that I don't need to go out there to do a convention to make a living. Some people do, and I don't mean to condemn it, and I guess I used to judge and say "Well, you should do what I'm doing and do it for the fans," but I guess some people just don't do that. Some don't have a job. Some aren't working, I guess why they're doing it, for the money, but I'm not. It's not about having the money to come see me. I encourage you to come see me anyway, and you're not going to get turned down or shot down. I want to shake your hand. I want to get a chance to meet you, and beyond all that, think about it. If I do stuff for free, and I always do, what's the investment on that? They're going to turn around log onto Facebook or Twitter and say, "hey, this was a great experience for me. He treated me like a regular human being." Some people that have 4 kids that can't afford it, each one of them leave with an autograph, because I know how it is to share as a kid. That's the reason why I have so many hits and so many likes is that there's nothing but good experiences. Yeah, there are a few nasty ones. I have my haters, trust me. The haters think that they can move mountains, but I have an army of people and those haters might be less than 100, and I have millions and millions of fans, so we're going to win. Everyone has haters, you just got to deal with them in a way where you pretty much ignore them and let them go away. You don't spend your energy on them, and that's something that I don't do, is waste energy on people that don't want a full part in me. Are you excited for all of Jason David Frank's new developments? Will you go see a Power Rangers movie without the original Green Ranger? Sound off in The Spoiler Room and let us know!